Video below...Handy and popular for handstitching, sewing, quilting, appliqué, knitting, crafts, travel, etc. Deluxe Hands Free Light Wide and Bright Light; Easy on the Eyes, lightweight and cool light for needlework. No need to sit next to a hot table or floor lamp or work in dim light. You can work anywhere - in a chair, bed, car, train, plane, or hotel room. Shines directly on the work in progress and doesn't disturb others nearby. The reflector head is adjustable for optimum positioning. 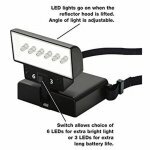 This patented light provides a unique combination of features, accessories, versatility, and battery life unmatched by other portable lights. 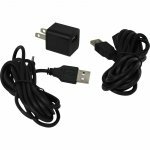 Brighter Light plus Longer Battery Life: The extra long battery life keeps the Beam N Read shining long after others have gone dim. Standard Alkaline batteries last for over 50 continuous hours when using 6 LEDs and over 100 hours when switching over to only 3 LEDs. Even longer during normal intermittent use (when do you run a light continuously for 2 to 4+ days). Unlike "book" lights that were designed to clip on printed books, our lights also work with soft materials such as patterns or instructions on loose sheets as well as newspapers and magazines and, of course, for loose fabric and yarn. They also work with all models of eReaders. Unlike headlamps, Beam N Read lights don't bounce around during normal head movements, won't shine in a companion's eye's when you look up at them, and won't give you headlamp hair. Unlike floor or table lamps, they run cool and comfortable and won't throw heat on your shoulders. 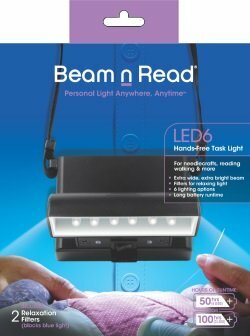 The Beam N Read LED 6 Deluxe Hands Free Light with 6 LEDs in a row for an extra wide and extra bright is the most popular model for needlework. The BNR LED 6-3 also gives a choice between cool daylight-type light or warm incandescent-type light. A clip-on orange filter shifts the LED light to a warm and softer light by reducing blue light. This is useful for those who find the daylight-type light from LEDs too stressful on the eyes. The filtered light is also more relaxing when stitching, reading or doing other tasks in bed at night. 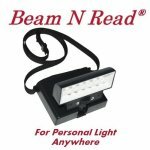 Beam N Read Lights are very versatile and can also be used for a wide range of other tasks including reading, travel, walking in the dark, care giving, and during a power outage.